When I arrived at the Choctawhatchee Basin Alliance office in Santa Rosa Beach, Florida, a high-tempo, tap-tap-tapping immediately arrested my attention. Surrounded by pine forest in general, the pavement is bordered by a handful of shorter, swaying palm trees. Echoing squeaks sounded from beneath their shade, and as I watched, a diminutive bird launched himself from the safety of the palm fronds to attack an unsuspecting car’s side-view mirror below. 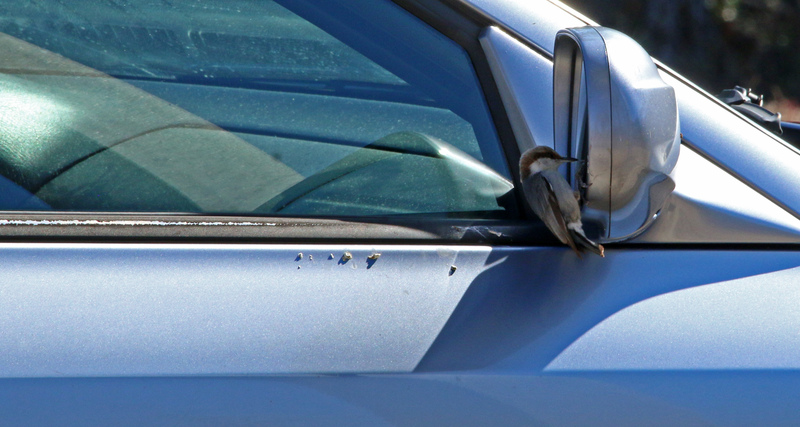 The Brown-headed Nuthatch started by perching at the top of the mirror, angrily rapping against the glass. When that did not satisfy him, he hung from the bottom, flitted to the window for a few hard pecks, then veered back to the mirror. Another joined the fray on a nearby car; after an additional round of peeps (their calls have been compared to rubber duckies) the two zoomed off, mere feet from my head. I shrugged, walking into work. Birds are weird sometimes. See the rest on 10000 Birds!